Hibbard was whelped somewhere in Tennessee, but I like to think he was born at Graceland and decided to roam the streets of Memphis only after learning Elvis was gone. My younger sister adopted him from an animal rescue organization in spring 2006, when the possibility of renewal seemed distant after the death of our first family dog, a wire-fox terrier named Eddie, that past fall. 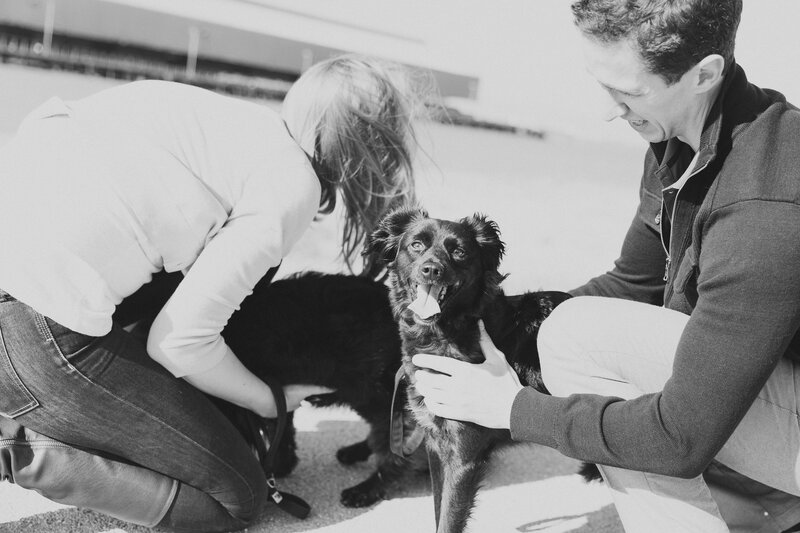 Eddie himself was a vessel of reconciliation and repair for me and my sister, who had struggled to put the death of our father behind us but found unexpected joy in a spunky dog that looked so much like his fictional namesake on the hit show Frasier. Adopting a dog only months after Eddie was euthanized for a variety of illnesses seemed untoward and a disregard for his animal spirit. I didn’t warm to Hibbard when he reluctantly jumped out of the back seat of a volunteer rescue worker’s car and trotted, tail down, into the house, his last steps on a journey that took him from the home of the blues and country to the hills of New Hampshire. Then again, I no longer lived with my mom and sister. It was their call. After he stopped nipping my hand, after he held firm on not stooping to gratuitous licks on the face, after he demonstrated his stoic bearing wasn’t simple shyness (if such a thing is possible), after he proved he was his own dog – I came around on Hibbard. 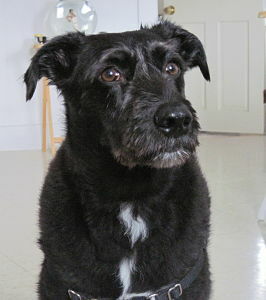 A border collie sprinkled with a dash of terrier, Hibbard has always looked like an old dog. His fur is jet black, save for grey beard whiskers and a streak of white that starts as a narrow path at his chest and widens into a full circle near his belly, giving the appearance of a mutt that won’t be caught without a tuxedo. His restful brown eyes say he’s a friend who doesn’t hold judgement. A friend who drops the cool demeanor only for the promise of a cookie. We thought he’d live for…gosh, who knows who long but certainly not just for 10 years. But this fall, on a cold Saturday, the routine of us and best friend was interrupted by repeated vomiting and, hours later, a diagnosis of terminal cancer. Surgery on the large circular tumor on his stomach would buy him only an undetermined amount of time, and at that, Hibbard would struggle to recover from an invasive procedure. Now, every day is a sad day – days that make us recall Hibbard’s best moments and almost overlook that he’s still here, woofing for a table scrap, napping in the parlor and sniffing trees for evidence of other animals. Medicine has gifted him a few more weeks, maybe months, but it’s been tough to talk to him, give him a hug without getting swept up in sadness. I’m particularly worried about my 83-year-old widowed mother, who, in the past decade, has said goodbye to three of her sisters and now can’t clearly communicate with the last surviving one because my aunt is living with dementia. Hibbard has been, especially of late, my mom’s sounding board, her companion. I recently decided to stop wondering how many days Hibbard has left and remember that it’s yet another sign of the inevitably of death. We all have our time and the times before then should be savored. I won’t feel sorry for him but instead will thank him for being yet another dog to bring joy into our lives. I’ll scratch his neck and belly, take him for long walks, and bring him not just one but three cookie bones on my remaining visits. Soon, Hibbard will be with Elvis and I’ll just have memories. If you enjoyed this post, you should read “A Dog’s Purpose” here. This is a beautiful reflection of his life! Well said Al! Thank you so much for the comment. I can tell this is one loved dog!